Before I start the outfit part of this post, I'd just like to give each and every one of you a hug for your sweet comments on Hope's post. You all are so supportive it makes me want to cry happy tears. For those of you who have asked, yes she wrote the whole post. She writes it in her notebook for me and I type it out word-for-word, 8 year old mistakes and all. ;) I'm letting her read the comments to her posts after I do a little sifting (and possibly weeding), so she gets the encouragement but doesn't have to see the ugly side of blogging quite yet. She's a little girl, and just like all little ones is still very sensitive and impressionable. 1) You are so gorgeous Katie. You legitimately glow. 2) I forgot to comment before but YAY HOPE! I can't wait to read more from her. love your dress...and your nacklace. is it made by you??? you look wonderful on every picture. If anyone was rude to Hope I will slap them up so hard. Don't let Hope read that though. She doesn't need to know about my vigilante justice. Love the little sdventure story. 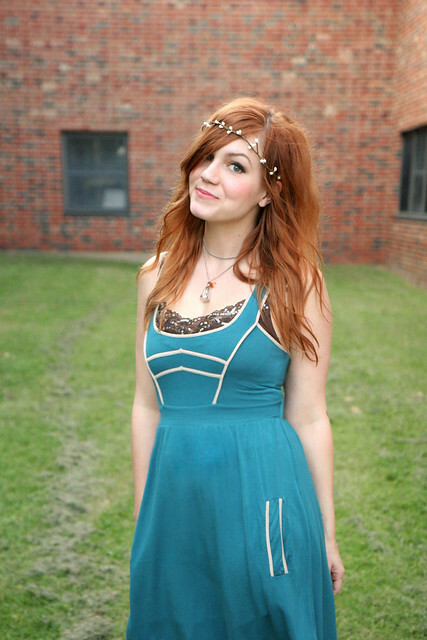 oh my, the red hair and the teal dress - magic! love love love it, you're so pretty! That outfit... That. OUTFIT!!! It's sensational! I love the teal and the brown together. I love the headband! I love the shoes! SIMPLY GORGEOUS! And gosh, I am jealous of your red hair! I miss mine! that being said, her post was great and the shots were worth it! you are too pretty! ;) love from brasil! Ah, cute! Your hair is the perfect colour. Absolutely beautiful!!! And I'm in love with that necklace, if you made it or someone you know please make more and sell them, i love it!! PS. Your headband thingie ... AMAZING. PPS. Redheads rule. The end. Katie you are so beautiful!! I love your beautiful dress + your lovely hair. I am sorry that you got locked inside of the school grounds. And for three hours no less!! Eeeep! You made the garland? Loves it! I think your story made the pictures even better. I love that dress! You always have the prettiest dresses Katie! The sacrifices we make for our blogs! Glad you have a good attitude about it too!!! Cheers! Your outfit is so lovely! I love your little wreath, it goes so well in your hair. You look oh so pretty. Those pictures turned out gorgeous! I'd say it was worth it! That is really funny. Thanks for sharing. And I love that dress on you. I love seeing you rock out with your beautiful fair skinned legs out! You look adorable, as usual. And those sandals are rocking. And I will say...if you are gonna be "locked up." At least a school is a good location. Bwahahaha....that color looks amazing with your skin and hair color. Your story sounds something like what might have happened to me! I am glad you all made it out ok.
First I have to say I just came across you blog and adore it. And now to your outfit post, what a story...and all just for some outfit shoots, but it was definitely worth it not just because of the pretzel! Your outfits are always perfect. Always. that is quite a funny story! what an awesome family for no one getting upset! the pics came out great. love your headband. and yay for pretzels!!! hahah - cute story! and your outfit is just adorable!!! Love that story, it probably wasn't funny at the time but months later it will be :) by the way look at that creepy owl sitting on the AC in one of those photos! did you notice that before!? Oh no, I would have freaked and just camped out in the car overnight. And your outfit is super cute! You have such a supportive little family! Your outfits are great! I don't usually like most people's daily outfits (I'm picky like that), but you put some awesome stuff together! I especially like this one. The color of the dress with your hair is wonderful! !